Blonde Redhead have been making enrapturing dream pop since the late 1990s, releasing eight albums of sensual guitars, poetic lyrics, and ethereal atmospheres. Their most recent effort, last year’s Barragán, is now being issued in remixed form with contributions from artists like Nosaj Thing and Deerhoof. Also featured on Freedom Of Expression On Barragán is New Zealand’s oddest and most enchanting songwriter, Connan Mockasin, whose rework of album highlight “Defeatist Anthem (Harry & I)” is stripped back, reducing the song to its core essence and filtering it through his weirder sensibilities. 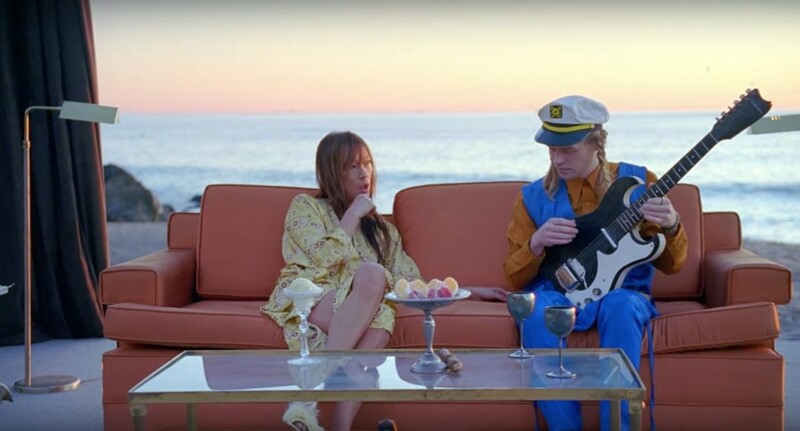 In its surreal video, directors Lung Club transport Connan and Blonde Redhead singer Kazu Makino to a dreamy beach scene with an on-stage living room and some Afghan hounds, with their slow interactions captured in one long take. Watch the video below, and read up on the concept behind it in an interview with Kazu Makino. What can you tell us about “Defeatist Anthem” and Connan’s remix? Kazu Makino: “Defeatist Anthem” is a song that I wrote about me and my horse sticking together through tough times. The song went through somewhat of a metamorphoses in recording, but I feel that Connan stripped it down to its essence — its initial idea and harmony. I love it so much. How do you and Connan know each other? Kazu Makino: I first met him at our show we played in a church in London some years ago. He came along with our mutual friend/producer, Drew Brown. Connan was lovely and shy, but I was already a fan of his music. Every artist on the remix album chose what they wanted to work on, and Connan chose “Defeatist Anthem”. How did you come up with the concept of the video? Kazu Makino: It was his (Connan’s) idea to make a video, and I’m so pleased that we did. It’s kind of a random idea to make a video for a remix song, but he needn't twice asking because I loved the idea. My very first reaction was to do it by the sea — some place warm — and he also told me that he used to listen to our music driving around by the sea in New Zealand. I think we talked about Connan’s world and my world merging... but it felt like it was destined to be, so I wasn't too worried about details. I was just looking forward to spending some time with him. It’s quite an elaborate setup. Kazu Makino: Yes, that's all due to the work the directors (Lung Club) put in up ‘til the shoot day. I was marvelled by the set too. I had no idea that it was going to happen in such a grand scheme, but I couldn’t be anything but relaxed and happy around Connan. And the sea was magical, and everyone on the set seemed to feel that we were in the right place and in the right moment. I saw whales and dolphins swimming back and forth so close to the shore. Someone said “I think they are checking us out” — perhaps (they were) trying to take a closer look at the Afghan dogs.